This Mt. 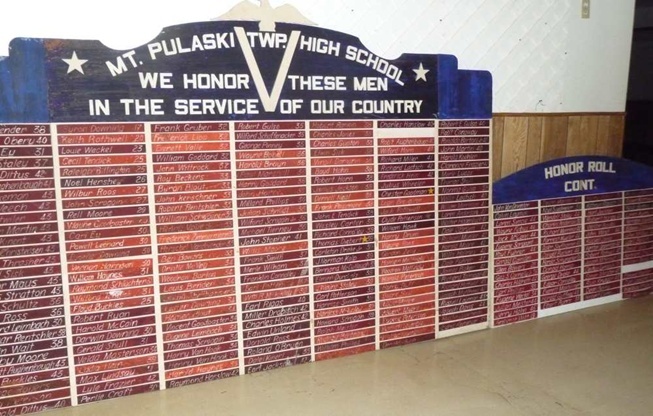 Pulaski Township High School WWII USA Military Service Board was constructed by Herbert Stivers (Industrial Arts Teacher), and the letter printing was expertly done by graduating senior, Paul Fuhrer (class of 1944). One glaring mistake: the board says “Men” when it should say “Men & Women” - the very first name being that of Pauline E. Bender, who served as a US Army Nurse during WWII. Also, Norma Gulso Miller and Katherine L. Allspach need to be placed on this board and perhaps others. Over the years, several names have fallen off – those of Julian T. Sams, Clarence Frazier, Emmett Shellhammer, Everett Maxheimer, etc. Note that the board has numbers to the right of each name which indicate the graduation year. Also note that several students did not complete graduation but nevertheless served our country. Thus, graduation was not a requirement to be placed on this board – only MPTHS attendance and service in WWII. For example, Vernon Voelker turned 18 during his senior year, having missed a year of school due to a child-hood illness. Unfortunately, Vernon was yanked out of school by our Logan County Draft Board, much to the chagrin and protest by MPTHS Principal, Lloyd Hargis. Finally, stars indicate the KIA’s, some of which have fallen off. NOTE: This WWII Honor Roll board was prominently on display in the old MPTHS gym entrance for many years. It is now in storage, waiting for someone (s) to renovate, up-date and display once again. *Bar Fee of $10/hour per bartender ?? *Illinois law required that all bartenders must be licensed. South Adjoining Space 100, approx.